Log homes have some characteristics that are very different from conventional homes, and it’s crucial for home inspectors to understand them. Settling is the loss of wall height over time. It’s one of the major concerns for a log home. Let’s look at some of the causes and consequences of settling. Log homes may be built from green logs, which are recently cut logs with a high moisture content. Or, they may be built using logs that have been kiln-dried so that their moisture content is no higher than 19%. Some log homes may have been built using logs with a moisture content somewhere between these two extremes. Moisture content is important because as long as logs continue to lose bound water — which is the water contained in the wood’s cell material, as opposed to the water in the cell cavities — the logs will continue to shrink in diameter. When logs shrink, the log walls settle, which will result in a loss of height. In a home built with green logs, it’s possible for an 8-foot tall wall to lose 6 inches in height by the time the home has finished settling. When a home has stopped settling, we say it has reached “equilibrium moisture content” (EMC) with its environment. 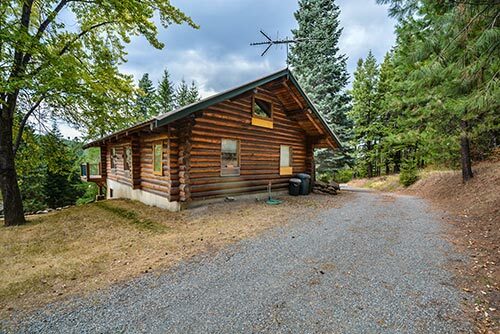 Allowances must be made during construction of log homes to accommodate the inevitable process of settling because a variety of components can be affected. If the home has a gable roof, and the gables are built using green logs, the gable wall will settle as the logs dry. Typically, in framing a gable roof, the ends of the ridge are supported by the gabled wall at each end of the roof. If that wall is losing height because the logs are settling, what’s happening to each end of the ridge? If the ridge is securely fastened to the logs, roof connections are going to be stressed until some roof or wall framing component breaks or becomes disconnected. These are both bad events. Which component breaks or where the disconnection happens will vary depending on how the home is built. If walls are going to lose height, what’s going to happen to the doors and windows? Will they stick or break? If the contractor understands log homes, the doors and windows will have a settling space above them so that the weight of the wall will not bear on the doors or windows. The settling space is typically covered with trim which is installed in such a way that it can slide as settling takes place. A newer home built with green logs that has no settling space installed above the doors and windows is a big problem. An inspector who fails to notice this condition would be making a major, major miss. As walls lose height, anything connected to them also loses height. If a staircase rests on a floor at the bottom and, at the same time, is attached to a landing or to floor joists that are losing height as the walls settle, after a while, the treads will no longer be level. There are a number of ways to correct this, but you have to know enough to look for it. Partition walls in log homes are typically framed conventionally. This means that although the log walls will settle, the partition walls will not. If the partition walls are framed from floor to ceiling, as they would be in a conventional home, something bad will happen as the settling log walls transfer weight to the partition walls that were not designed to bear weight. The stress will build until the weakest component fails. The intersections of conventional walls and log walls have to be framed using methods that will allow the log walls to settle while the conventional walls stay put. Failure to use a connection method that will accommodate different settling rates can cause ugly problems. This is also true for other portions of the home that intersect the log walls but don’t settle at the same rate as the logs themselves. This might be a fence or an architectural feature of some sort. It’s a common condition. In homes of two stories and more, plumbing pipes and rigid conduit that are installed vertically will accumulate stress as log walls settle. There are ways to accommodate settling. Using slip joints and coils are two methods for overcoming this problem. Flexible copper tubing is sometimes used instead of rigid copper pipe. It’s also possible to see the methods and materials used, but sometimes you have to make an educated guess. Remember to disclaim anything you can’t see. In order to accommodate settling, log homes sometimes use screw jacks, which must be adjusted occasionally. Screw jacks are often hidden behind trim, so you have to know where to look for them. Posts that support porch roofs and lofts are common places to find screw jacks. They may be installed at the top or bottom of a post. Most home inspectors are familiar with wood decay. Design features that direct runoff onto log walls, especially log extensions at outside corners, will encourage the development of decay. This is decay you can see because it usually appears as dark discoloration. It happens first at log extensions because the exposed end-grain absorbs moisture faster than the rest of the log’s surface. Lower wall logs are also at risk, since they can be soaked by splashback during rain and are less protected by the roof overhang. A situation that can cause big trouble is decay that is not visible because it’s inside the log. Log homes can be destroyed in this manner with very little visible decay. A common scenario is that the home is located in a region with high humidity. If an impermeable finish coating is applied to log exteriors while the interior log moisture content is high enough to allow decay to take place, that moisture will be trapped inside the log and decay will continue as long as there is adequate moisture in the wood. Logs become deteriorated by weather. Finish coatings are designed to protect log surfaces from UV damage and excessive checking caused by log drying. Some coatings also prevent attack by some wood-destroying insects. Finish coatings don’t last as long as they used to because the EPA has placed limitations on the use of some environmentally toxic products that also happened to protect logs from weather well. Wood-destroying insects usually leave some clue as to their presence. The size, shape and condition of entry and exit holes can indicate what species of insects are likely to be living in the logs. Both termites and carpenter ants grow wings and swarm to new locations every so often. When they arrive at their destination, they shed their wings and burrow into the wood. Wing piles are a sign to look for. You may also see dead insects on window sills inside the home if the swarm originates inside the home. Some types of insects are relatively harmless, while others can cause structural damage. Because there is so much wood in a log home and because it’s so exposed and vulnerable, it’s a good idea to look for wood-destroying insects. Log home owners are well advised to be on a routine exterminator program.